Disneyland® Paris is the best known theme park in France and provides a great fix of Disney magic without the transatlantic flights. The park comprises the Disney park and the Walt Disney Studios park and you’ll need two or three days to get round most of the attractions comfortably. 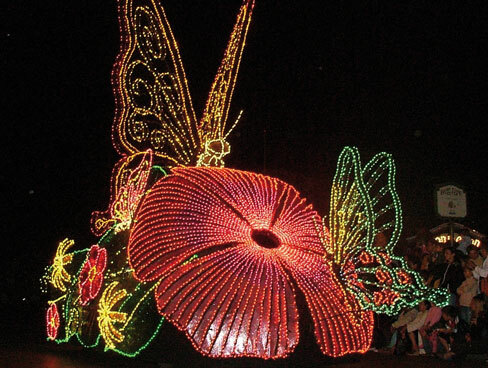 There really is something for all ages here from magical rides that take you through the classic Disney fairy tales, to thrilling rollercoasters for older and more daring visitors. Highlights for younger children include the “Small world” boat trip (the song will stay with you for days – you have been warned! ), the Peter Pan ride where you ride across the London sky to fly away with Peter, and the Toy Story ride complete with laser guns in each car to shoot the targets and defeat the evil Emperor Zurg. Older children may want to ride famous Space Mountain, Big Thunder Mountain and Indiana Jones Temple of Peril for some fast paced fun, but there are also plenty of rides the whole family will love including the Finding Nemo rollercoaster in the Studios park, the atmospheric Pirates of the Caribbean boat ride and the extremely convincing Star Tours space flight simulator experience. You might be surprised to find that the rides are only a fraction of what Disneyland® Paris has to offer; the themed ‘lands’ are so well staged that just walking around exploring the scenery can be a real highlight. Sleeping Beauty’s castle, the Swiss Family Robinson treehouse, Pirates caves, Wild West hideouts and jungle walkways are all just waiting to be explored! There are plenty of stage shows and meet-and-greets with characters who pop up around the park quickly attracting long queues. The top rides can also get busy with waiting times clearly displayed so you can decide whether or not to wait, there is an app you can download that shows current waiting times across the park so you can choose where to go next. Fast Passes are available to buy to get priority on the most popular rides. If you are going with a child who will be determined to meet the Disney Princesses come what may, you might want to consider booking a meal at Cinderella’s Restaurant – it costs a lot, but your table is visited by lots of the main iconic Prince and Princess characters who take the time to talk to your children and have photos/sign autographs. With this box ticked you’ll be free to enjoy the park without queuing for meet-and-greets for the rest of your visit! Don’t miss the Walt Disney Studios Park shows – Animagique, and CineMagique are enchanting. The Behind the Scenes tram tour is not to be missed with amazing special effects going off just a few feet from your carriage! The cave under Sleeping Beauty’s castle is a hidden treasure – the sleepy dragon is realistic enough to keep younger children guessing so don’t forget to pay him a visit! 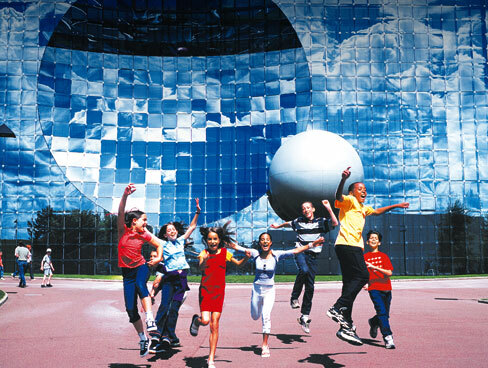 Futuroscope is a tech-focused theme park using 3-D and 4-D cinematic experiences and simulators to entertain and educate visitors. Top attractions include the ‘Time Machine’ that takes you on a madcap 5D train journey through history led by a team of zany characters called the ‘Raving Rabbids’. 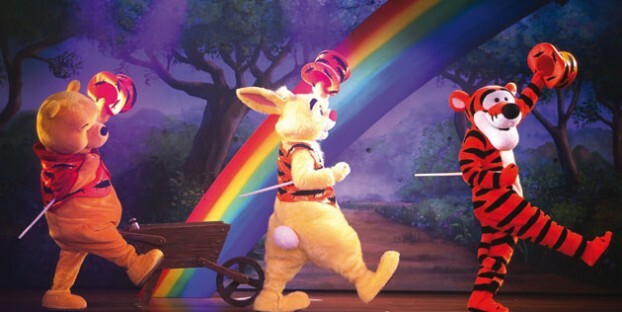 The Arthur 4D adventure sees you shrink to fairy size and ride a ladybuggy on a mission to help Arther the Minimoy – an enchanting immersive experience for all ages. ‘Dances with Robots’ is another favourite allowing you to ride a 23 foot robot arm as it ‘dances’ to music, you can choose from three levels of intensity to tailor the ride for the more timid (or adventurous!) amongst you. The park also has more educational experiences including ‘Journey into the dark’ where you can experience iconic landmarks as a blind person, and films that use 3D Imax technology to reveal the wonders of the deep seas and outer space. The films are in French so if you want a translation you’ll need to use a translation set with headphones. With more than 25 experiences on offer you’ll need to plan carefully to see everything, and at peak times queues can get lengthy. Upgrading to a Premium Pass reduces queues on the top 5 rides and reserves seats at the spectacular night show. Children under 7 may fall under the height restriction for many rides so you might want to check in advance to avoid disappointment. Get kids excited about science travelling inside a human body on ‘Virus Attack’ and exploring eco-friendly energy sources in The Gardens. Take your seat at the Aerobar before rising through the air to enjoy a drink suspended 115ft up with a great view of the park. Don’t miss iMagic – a mind blowing Vegas style magic show with a fantastic atmosphere that will captivate children and adults alike. Puy du Fou is a historically themed park more about spectacle, performance and atmosphere than rides. Incredible reconstructions including a vast Roman Amphitheatre, a medieval town and a Viking village are so well presented you feel like you’re on a professional film set. There are sixteen different shows to see so plan your day around the timetable to see actors and stunt men in authentic costume recreate amazing historical scenes using fire, water, live animals and special effects. 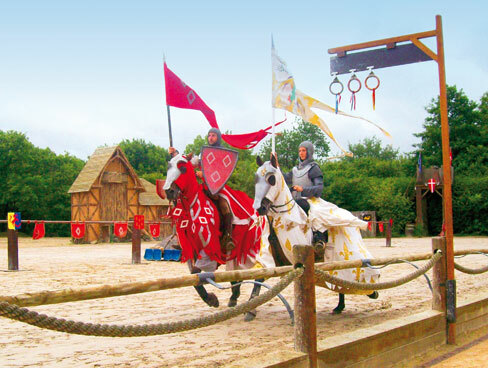 See Roman chariot races, a Viking longboat attack, Knights, Musketeers and so much more. There are even evening performances featuring incredible light and water backdrops to the action; the epic ‘Cinescenie’ show includes 1200 actors! 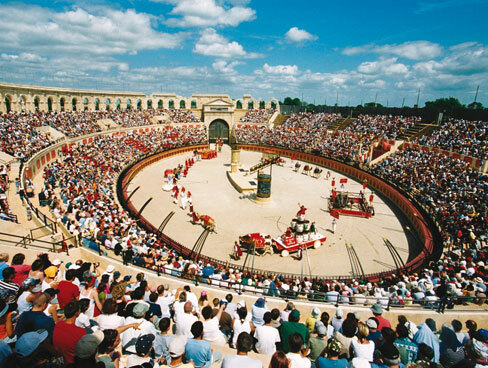 Puy du Fou is a French theme park and all performances are delivered in French. Headsets with translation are available but many people feel the performances communicate the dramatic tales effectively despite language barriers. The park is also very, very large so buggies for younger children will be essential. Don’t miss ‘The Phantom Birds Dance’ a remarkable choreographed display that includes 170 birds of prey. Plan your day – prioritise your ‘must-see’ shows and queue early or invest in an ‘Emotion Pass’ for priority access to seats at the top six attractions. Marineland is a marine wildlife park while Aquasplash is a water park. The two attractions are very close and a joint ticket to visit them is excellent value for money if you are staying in the area; there is even an option to split your visits over two days. The main attractions at Marineland are the outstanding display shows where whales, dolphins and sea lions perform with their trainers for the crowds. There is a timetable of shows available so you can plan your day around them and be sure to see them all! Between shows you can visit enclosures housing penguins and polar bears and walk through aquarium tunnels to see sharks, turtles and other marine life. Aquasplash is a typical water park with plenty of fun for people of all ages. Kids Island is a shallow area with tunnels, slides and climbing structures for younger children, Pirates Island takes it up a level for older children and there are plenty of slides and water current rides to try out. Marineland offers ‘meet and greet’ sessions where children can get up close to a seal lion, dolphin or shark! An unforgettable encounter for an animal lover. You’ll need to book in advance – minimum age for these sessions is 3 years old to meet the seal lions or dolphins and 10 years old to meet the sharks. Take on the Obstacle track challenge at Aquasplash – can you get across the lagoon without a total wipeout? Family fun with a competitive streak! Explore the ticket options to save money – you can get combined tickets for Marineland, Aquasplash, Kid’s Island (a complex of adventure playgrounds) and Adventure Golf (mini golf on three themed courses). Built in an area where the landscape has been shaped by now extinct volcanoes, Vulcania is a volcano themed attraction including a healthy balance of excitement and education using rides, 5D film experiences and special effects. Discover what goes on beneath the surface of volcanoes with a range of real footage and exciting reconstructions on the rides and giant screens. The Awakening of the Auvergne Giants even shows what would happen if the old volcanoes here were to become active once more! An interactive science exhibition for children, outdoor play areas and a playmobile Volcano scene mean there is plenty for children of all ages. While many rides are recommended for 5 years and up you can often decide for yourself if you feel an earthquake simulator or ride into a dragon’s lair is suitable for your child. Don’t miss the Dragon Ride, a magical ride that combines geological fact and mythical creatures in a spellbinding 3D journey. Take a picnic to eat by the incredible 20ft ‘geyser’ fountain before exploring the interactive water displays in the aquatic gardens. Take a trip 150m above the park in the tethered hot air balloon for a fantastic view of the scenery in the area. Top 5 Regional Natural Parks in France – Get Back to Nature!